Sasquatch feet aren't just big they are "Yuuuuge!" Some readers may recall that staffers of President George H.W. Bush referred to Portland as "Little Beirut" because of the protests encountered by Bush on his trip there. Donald Trump, as many other conservatives, may not campaign much in Oregon. With that on mind, The Oregonian, Oregon's largest newspaper, decided to try and imagine what a Trump campaign speech might sound like. It included fixing the Columbia River, being smarter than fish, having good relations with beavers and, most importantly, bigfoot policy. Read just the bigfoot policy excerpt below. So you can see I could do amazing things for Oregon. Bigfoot won't come out and talk to anybody? He'll talk to me. 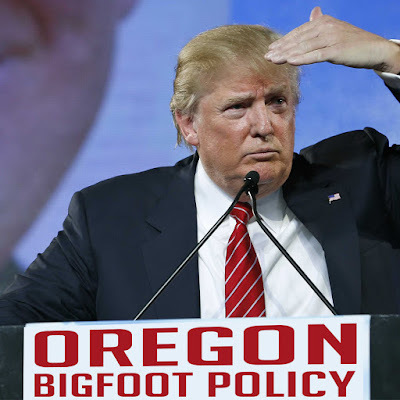 More than anybody who has ever run for president, I know Bigfoot. I was on a talk show with Bigfoot — the network begged me to come on — and he's a good guy, although not as smart or good-looking as I am. Between you and me, even my feet are bigger, although the media won't tell you that. I would give the Northwest what it's never had, a winning Bigfoot policy. We've got a Bigfoot policy put together by losers, a Bigfoot policy run by people with small feet and smaller IQs. I could bring Bigfoot out by offering him a free week at a Trump hotel. Nobody would refuse that, because Trump hotels are the greatest places in the world. Another paper supports the rough back-and-fourth between the TV Critics and cast of Finding Bigfoot had at the 2012 Television Critics Association Summer Press Tour. It should be no surprise that Bigfooters would be able to handle a critic or two--let alone be confronted by them. Cliff Barackman is, in our opinion, one of the greatest Bigfoot ambassadors to the rest of the world. 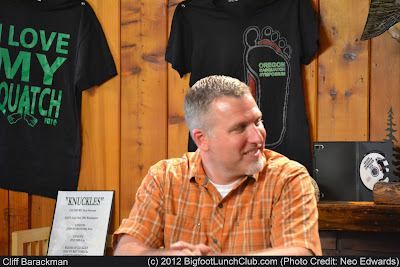 Click on the following link to read our previous coverage of Cliff Barackman. Read the piece below from Cliff's hometown paper The Oregonian. Writer Kristi Turnquist finds Cliff at the TV Critic event and asks him a few questions. BEVERLY HILLS, CALIF.: Cliff Barackman and his castmates from the hit Animal Planet show, "Finding Bigfoot," were facing a pretty tough crowd Thursday at the 2012 Television Critics Association Summer Press Tour. Barackman, who lives in Portland, and his fellow bigfoot researchers, James "Bobo" Fay, Matt Moneymaker and the show's resident skeptic/biologist, Ranae Holland, take their investigations into bigfoot sightings around the country seriously. But the critics and reporters on hand were, at least initially, not what you'd call on board. Getting things off to a bumpy start were questions like this one, directed toward an executive from Animal Planet: "What's made Animal Planet concentrate on bigfoot, have they run out of real animals?" Also, there's not just one bigfoot, as Barackman believes, based on eyewitness sightings, photos and footprint evidence. He theorizes that bigfoots are primates, a form of ape that may also be very "human-like." Before the panel, Barackman told me that his interest in researching bigfoot partly accounts for why the Long Beach, Calif., native wound up moving to Portland, about four years ago. "I"m kind of a weird guy, so I feel at home there," Barackman said as we sat in the lobby of the Beverly Hills Hotel, site of the TCA tour. And, he added, "Bigfoots live right outside of Portland," citing reports of bigfoot encounters in the Sandy River area, and Clackamas County, for example. Not that they're limited to the Northwest, Barackman added, as he and the "Finding Bigfoot" team have so far visited 22 states for the show. Barackman, 41, first got intrigued by bigfoot, or Sasquatch, investigation when he was in college, and came upon scholarly reports discussing the possibility of bigfoot-like creatures. Though he has a degree in jazz guitar, and has been a schoolteacher (at Cascade Heights Public Charter School, among others) Barackman is now working fulltime on Sasquatch research. "Finding Bigfoot," which debuted in 2011, has been a hit for Animal Planet, ranking as the cable network's third-most watched show, behind "River Monsters" and "Whale Wars." The new season of shows begins in November, with 11 new episodes. Barackman, who is single, said that as much as he feels at home in Portland, his Sasquatch travels keep him on the road so much he hasn't been able to spend much time in the Rose City, even though he just bought a house. And he's not concerned by skeptics who think searching for bigfoot is a rather eccentric, shall we say, calling. "It doesn't matter to me," he said. "When you're right, you don't have to prove it to anybody." As to whether he's personally seen a bigfoot, Barackman cites the "Finding Bigfoot" episode shot in North Carolina. It was the middle of the night, in the woods, but Barackman thinks the creature he saw wasn't a human, but could very well have been a Sasquatch. His conclusion: "I might have seen one. But I can't be sure I saw one." Below is an article by Thom Powell for the Oregonian. 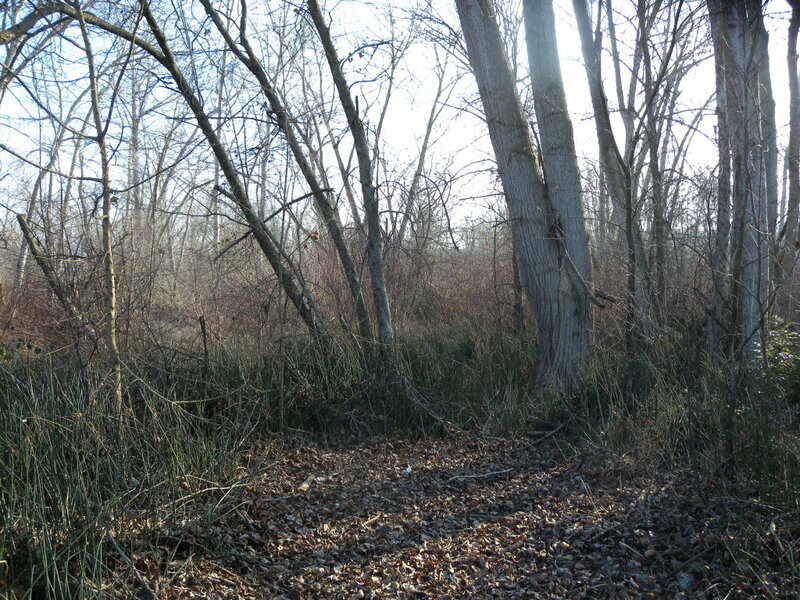 Although it is not strictly about Bigfoot, Powell does suggest a connection between the words "Squaw" and "Sasquatch". Fascinating Stuff! The Oregonian's story on the removal of offensive place names was interesting and accurate -- mostly. A few interesting additions: The modern-day movement to change offensive place names began with an Oprah Winfrey show in 1992. A guest on her show declared that use of "squaw" as a place name was offensive. The Oregonian's story explained that the word was derived from an Algonquian name for "woman." More accurately, the translation is said to be something on the order of "female reproductive parts." Algonquian as a tribal language was spoken only in the northeast corner of the U.S. and Canada. Three quarters of the continent's tribes did not recognize the word at all, much less regard it as something offensive. Nineteenth century linguists may have incorrectly translated the word as a more general reference to female Indians. Being easy to pronounce and remember, it was then carried across the continent in the minds of explorers, trappers and settlers who were completely unaware of any implied insult associated with the term. They were a hardy bunch, but the early settlers were not always literate, and they definitely weren't politically correct. They doubtless used disparaging terms for females of all races, including their own. Yet, "squaw" was not meant to demean or offend when it was assigned to plants (squawberry, squawroot), places (Squawback Ridge, Squaw Butte), and people, male or female. Interestingly, a white man who took an Indian bride was a "squawman." Consciousness-raising began with a 1992 episode of the daytime talk show "Oprah." Guest and Native American activist Suzan Harjo, appealed for change to demeaning names used by professional sports teams (think: Washington, Cleveland and Atlanta) even though such names are intended to convey generally positive images of warrior-like fierceness. In any case, Harjo bolstered her position by invoking other linguistic insults such as use of the word "squaw." Not being an expert in Algonquian herself (she is Cheyenne), Harjo cited a 1972 book, "Literature of the American Indian," in which the authors raised the dubious claim that the word referred to female genetalia in the Naraganset dialect of the Algonquian Nation. In truth, it is not at all clear which of several words has been anglicized into "squaw," but "eskwaw," "esqua" and "ojiskw" are all possibilities. Other Algonquian tribes used "squa." By the way, the Algonquian term for white settlers was "wasichu." How would that do as a team name? Anyone want tickets to see the Washington Wasichu play? In any event, leave it to explorers and settlers to phoeneticize and simplify tricky pronunciations, then carry them westward, but the story probably doesn't end there. No Indian in western North America ever named a place using Algonquian terms, but white explorers and settlers may have. 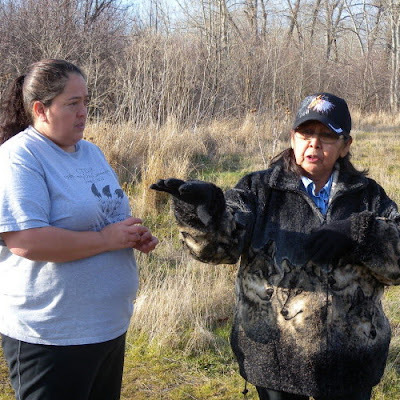 Why places such as the remote Squaw Butte in Clackamas County would be so named is less clear. Did an explorer see a female Indian there? That's possible, but I doubt it. My own research suggests that another Indian term in use more locally may have been confused and simplified into the handier term "squaw." Squaw Butte sits within the lands once occupied by the Clackamas band of the Chinook Indians. 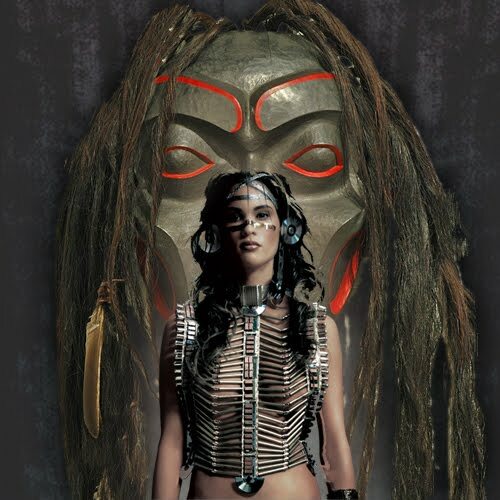 Nearby, the Kwakiutl Indians of the Pacific coast used the term Tsonoqua. This term, also spelled "Tsonokwa," translates into "a wild, very hairy female being with big feet." Another put down? I don't think so. Rather, it's a reference to a female "sesquac" or sasquatch, as we call them today. The "tsonoqua" was a female bigfoot, and while the concept of the sasquatch or bigfoot is much ridiculed in modern society, the Indians in virtually all parts of North America had terms to describe these elusive and mysterious beings. As it turns out, Squaw Mountain lies in a remote location in the Mount Hood National Forest where the legend of the sasquatch persists to the present. Pioneering research on this point, done by Molalla resident Frank Kaneaster, even identifies Squaw Butte as being at the center of a cluster of modern sasquatch sightings. My own research bolsters Kaneaster's dubious data set with two more sightings by local hunters who emphatically claim that a sasquatch is what they saw while hunting the flanks of Squaw Mountain. 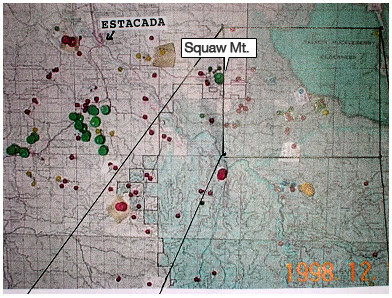 Frank Kaneaster map with color-coded pins showing a cluster of reports near Squaw Mountain . When one examines the places in Oregon alone that bear (or once did) the name "Squaw", they all bear an interesting similarity: They are remote, even by today's standards, and so were even more remote in the days of early wasichu (white) settlement. They are surrounded by other place names that hearken of the mysterious wild beings: Devil's Ridge, Devil's Lake, Skookum Lake, Tarzan Springs, Skookum Meadow, Diablo Mountain and more. Virtually all North American tribes embrace the wildman or sasquatch phenomenon. They uniformly regard these beings not as animals but people, member of a mysterious but very real tribe. And if the sasquatch, or skookums, exists then there are females, for which one of the local terms was Tsonoqua. This is a more likely origin for the word "squaw" when referencing remote geographical places in the Pacific Northwest that were actually named by the Indians, not the wasichu. I guess it doesn't matter anymore. The Forest Service has removed the name from the creek and its parent butte. It is now known as Tumalo Creek and Tumalo Butte, which, in the Klamath dialect, means either "wild plum" or "cold water," depending on which translation one accepts. A strange choice considering the Klamath Indians didn't live around here, and the name "Tumalo" is already prominent in central Oregon. It's also kind of a boring name. I mean, "Coldwater Creek"? "Wild Plum Butte"? C'mon, guys, is that the best you could do? If we're going to change the name, how about reverting to "Tsonoqua"? It's probably the original name for the place, and laugh if you will, but the place does have a history of reported sasquatch encounters to back it up. The Indians don't laugh, but they don't discuss their feelings on the subject with the wasichu either. They know all too well our tendency to label unfamiliar beings as animals, then use that as an excuse to shoot them. Tsonoqua may be an old name, but it is not as easy to spell or pronounce as is "squaw." The nice thing about "Tsonoqua" is that if some of the locals don't like it, they can just slur it, and it will sound like the traditional wasichu name. That's probably the way Squaw Butte got its name in the first place. Now, if I could just get on "Oprah," I know I could change people's minds. Thom Powell lives in rural Clackamas County and teaches sciences at Robert Gray Middle School in Portland. He is the author of "The Locals: A Contemporary Investigation of the Bigfoot/Sasquatch Phenomenon."